James “Jim” Edward Stubblefield, 74, a longtime resident of Truth or Consequences, died on Monday, December 10, 2018 at Presbyterian Hospital in Albuquerque, NM. He was born on May 9, 1944 in Albuquerque, NM to Clarence and Mildred Lucille (Flack) Stubblefield. Jim served in the U.S. Army as a Combat Medic in Vietnam. In 1978, Jim moved to Truth or Consequences from Roswell, NM. On November 1, 1983 he married his wife, Deborah (Schraner) Stubblefield. He was a Respiratory Therapist and owned and operated Respiratory Services for 32 years. He loved trapshooting and was inducted in the New Mexico State Trapshooting Association Hall of Fame in in 2016. 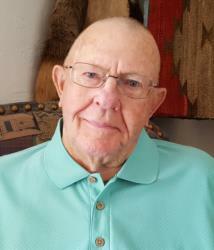 Other interests included golf, riding motorcycles and hunting with his beloved bird dog, Kolar. Jim was also a member of the First Baptist Church and of the Bethesda Masonic Lodge No. 64 AF&AM of T. or C.
Survivors include his wife of 35 years, Deborah Stubblefield; daughter, Katrina Whitley; 6/grandchildren; sister, Sharon Harrington & husband, Ken; and brother-in-law, Jimmy Schraner. He was preceded in death by his parents Clarence and Mildred Lucille Stubblefield; and by his son, James Kyle Stubblefield. Cremation will take place and a Memorial Celebration Service will be held on Thursday, December 20, 2018 at 10:30 A.M. at the First Baptist Church with Rev. Dudley Bristow officiating. Interment will follow at Vista Memory Gardens Cemetery. In lieu of flowers, the family has requested donations be made to the First Baptist Church building fund, “Continue Our Journey”, P.O. Box 329, T. or C., NM 87901. So sorry to hear this. My prayers are with you all. I am so sorry for you loss you and your family are in my thoughts and prayers. Sleep well our friend. We're going to miss you SO much but we are glad that you are at peace. Peace be with you. May you fly high. I would like to express my condolences to the family and friends of James Stubblefield. There will come a time when death and mourning will be no more. (Revelation 21:3,4) This is what our loving God, Jehovah, has promised. We also have the hope of seeing our loved ones again. (John 5:28,29) May those verses bring you some comfort in your time of mourning.